A variety of toys help baby achieve important developmental milestones such as gross and fine motor skills, self-awareness, tactile development, and more. As "a safer alternative" to walkers, the ExerSaucer provides baby with the benefits of stationary exercise with rock, spin and bounce capabilities. 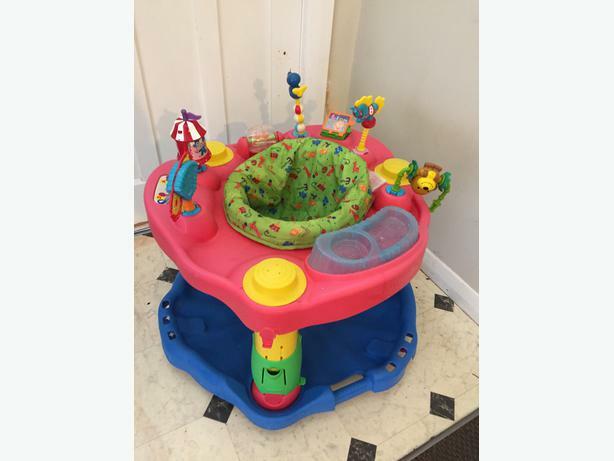 The Mega Exersaucer includes loads of circus-themed activities that promote mental and physical stimulation. The colorful shapes and toys promote cause-and-effect learning, object permanence awareness, visual and tactile development, and hand-eye coordination. This activity center also features a dishwasher-safe snack tray and machine-washable seat pad for easy cleanups. Evenflo partnered with the Child Development Institute, to develop ExerSaucer activities that engage a baby's senses, spark imagination and encourage interaction. For over twenty years, ExerSaucer activity centers have helped children develop their gross motor skills, fine motor skills, object exploration, cause/effect learning, self-awareness, tactile development, visual development, object permanence and hand-eye coordination. Give your baby an ExersAwesome head start.